For the first time in its 40 year history of charitable giving, Tom’s of Maine, the natural toothpaste company, opened up its funding process to the public, letting them vote on who will get $100,000 in grants. In their “50 States for Good” campaign 2,000 organizations from around the US submitted applications to be considered for voting. The editor of the Good News Network was one of five judges who initially whittled the list to 50 finalists. After weeks of voting and 280,000 online ballots collected, five community projects were chosen to each receive $20,000 for creating lasting positive change in their communities. The five winning projects, announced yesterday, have plans for helping abandoned animals, gleaning fresh vegetables from fields for food pantries, giving disabled folks a ramp-up, helping a school avoid flooding while teaching conservation, and creating a community garden to help low-income families. The Corridor of Cruelty & Neglect, Houston Mobile Clinic, Houston – The money will be used to help an area of Houston dubbed the “Corridor of Cruelty & Neglect”, where animals are often abandoned, injured or ill. A mobile clinic will work with animal rescue to get animals to the clinic for health care and sterilization, with the aim of finding homes for them. Project Access, Rutherford Housing Partnership, Rutherfordton, N.C. – Project Access is a ramp-building project to provide handicap access to 15 to 20 low-income homeowners in the county who cannot now safely access their homes. Free Fresh Produce: Gleaning for DC’s Poor, Bread for the City, Washington, D.C. – The money will support weekly trips that send volunteers into fields of regional farms, where they’ll collect tons of fresh produce that would otherwise go to waste. A couple hours of labor from a couple dozen volunteers can yield free produce that will feed a couple thousand families for a week. Butterflies and Boulders: A School Greening Project, Coeur d’Alene Elementary School, Venice, Calif. – The money will be used to remove 8,000 square feet of asphalt, and replace it with drought tolerant plants that allow rain to percolate into the soil rather than flood the school. This special garden and its integrated curriculum will teach lasting lessons of conservation and promote awareness of the local watersheds. 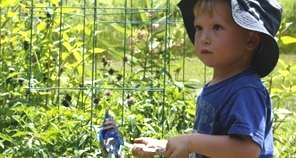 Grow Food, Grow Hope Garden Initiative, Wilmington, Ohio – The money will create a community garden for low-income families, grow produce for area food banks and coordinate grower co-ops and farmers’ markets to increase fresh food access for low-income families.